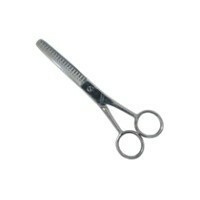 Wahl Pet Grooming Thinning Scissors are a pair of double sided thinning scissors with 6 inch blades. They are an ideal tool to use if your pet's coat has become matted or unmanageable, or if you simply just want to give them a quick trim down. With a professional high quality, you can keep your pet looking their best with ease. Appropriate for all breeds of dog.